Rafting junkies are sure to recognize the funky sounding name Futaleufú as one of the most exciting rivers in the world. The Futaleufú (pronounced Foo-tah-lay-oo-foo) River, known as the Fu, is a whitewater legend with its Class IV and V rapids. It’s like rafting down a frothing surge of turquoise champagne. Spilling out of the Andes and across the northern hinterlands of Patagonia, the Futaleufu is a meandering ribbon of turquoise and teal that runs down a basalt gorge referred to as “the gates of hell.” 47 rapids occur throughout the Fu, ranging from easier Class II’s to the more challenging Class V.
On our Futa rafting and multi-sport trip, we spend 5 days cruising the Futaleufu and finding the adrenaline rush only riding the rapids can provide. But rafting isn’t the only adventure you’ll have while tucked away beneath the rugged Andes. Each rafting day is bookended with activities such as a relaxing yoga session on our riverfront yoga platform or a hike on one of the many nearby trails. Kayak down the Río Azul, take a horseback ride through sprawling valleys, or hop on a bike to explore the natural world right outside your door. Though each day is packed with possible action, there’s also plenty of opportunities to enjoy some downtime—in style of course. Treat yourself to massages on site, relax in a wood-fired sauna, or snuggle up in a cozy chair for some reading with a view. With happy hours at sunset and mouthwatering dinners by candlelight, each day is topped off with an additional dose of indulgence before you head off to bed in your riverside private bungalow. Come take on the Fu’s might rapids and soak in the scenery. Snow-streaked volcanoes and lush green rainforests frame the Fu, and there’s no better place for an adventure. Fly into Santiago, Chile’s cosmopolitan center sitting on a plain in front of the Andes. Enjoy the views flying in as you collect your luggage, go through customs, and re-check your luggage before boarding the short domestic flight to Puerto Montt, the portal to Chilean Patagonia. Upon landing, our ROW Adventures and local guide welcome you. From there, you are conveyed to Puerto Varas, a picturesque town that greets you with quaint Germanic homes and modern Chilean verve. It’s an adventure hub rivaling Pucón, leaving room for adventure in your first Futaleufu rafting day. We gather together in the hotel lobby bar at 7:00pm for group introductions and a tour briefing. After, we head to a favorite restaurant of ours for a welcome dinner where you can sample some Chilean seafood before returning to our hotel. We breakfast early before making the brief drive to the La Paloma Airport, from which we catch a flight over some of Patagonia’s most scenic landscapes. A short 30-minute flight takes us to the small village of Chaitén and its surrounding beaches, rivers, and woods. If we have time, we take a jaunt to the nearby Pumalín Park for a short hike. The 715,000-acre park stretches from the central Andes to the fjord punctuated Pacific Coast—an increasingly rare attribute found in rainforests worldwide. Explore the lush vegetation and look for some endangered, mammoth, millennia-old Alerce trees on your hike. After our hike, we take a 2-hr drive to the basecamp overlooking the Futaleufú River. The drive itself is a scenic pleasure as we travel along the placid waters of Lago Yelcho, dense rainforests, rugged glaciated peaks rising through the cloudline, and ponderous hanging glaciers. Once we reach the banks of the Fu, get ready for a great view. Named for a derivative of a Tehuelche Indian word meaning “big big river,” the Fu lives up to its namesake in every way. Upon arrival at the camp, settle into your private tented bungalows nestled onto a cliff overlooking the Fu. Then, set off and explore! Take a swim in the river, take a hike in the surrounding woods, or take a luxurious soak in the hot tub looking out over the river. As afternoon settles, gather together for happy hour and a brief camp orientation before dinner. Settle into your bungalow and enjoy the sound of the river as you head to bed. Wake to the sounds of the Fu on your first morning at the basecamp. You have several options regarding your morning activities. If you’re ready to explore Futaleufú Valley, whose rugged terrain will be sure to wake you up, take an early morning hike and wonder at the 6,000ft vertical relief between the glacier-crowned mountains and the valley floor below. For those who prefer a sun salutation, we also offer a yoga class on our riverfront yoga platform—or in our loft during poor weather. If you prefer a quiet morning, sleep in and simply enjoy the morning sun before we all gather for breakfast. After breakfast, we venture to the Fu. Before we launch off, our guides lead you through a safety briefing as well as practice rescue drills to ensure that you are prepared to have an incredible time paddling in a safe environment. We launch from base camp and begin our paddle down to Puente Futaleufú (the Futaleufú Bridge). Though this first section is only 10km long, it offers more quickly sequential rapids than anywhere else on the Fu—including the Fu’s “El Cojin,” “Mundaca,” and “Cushion” rapids. It’s the ideal way to get your raft wet and see what the Fu is all about. Once we reach our take-out point, we disembark and are met with vehicles who take you back to camp. If you are up for some more exercise, you also have the option of hopping on a mountain bike or taking a run to get back to camp. Then, the afternoon is yours! Pick up a pole and go fly-fishing, head out for a hike, hop in a kayak, run through some more yoga poses, relax in a hammock with a book, have a massage, soak in the hot tub, or sit in the sauna. It’s easy to find an adventure or luxuriate in the wild beauty of northern Patagonia. As evening settles in, enjoy a happy hour before gathering together for dinner in our dining area under the stars. Our candlelight dinner features produce grown on site as well as freshly baked breads. Then, cozy up to the campfire and enjoy the bright stars before retiring to your private bungalow. Rise with the sun and start your day with another hike or yoga class before breakfast if you’re up for it. After breakfast, we once again launch our rafts from the camp’s shores and begin our journey further down the Fu. We enjoy some calm waters and lunch on the river in between rapids. After we pass yesterday’s Puente Futaleufú, our paddle takes us to the “Mas o Menos” rapid. Though the name translates to “More or Less,” Mas o Menos definitely offers “more” rapids in its long, rolling stretch of waves. It’s excellent preparation for the rapid coming up next, “Casa de Piedra”—the biggest rapid to be found on the lower Futaleufú. We briefly dock our rafts to get sight of the massive rapid formed by water churning through outlying boulders. If the Class V rapids look a bit intimidating for you, you have the option to circumvent them. Otherwise, get your adrenaline rush riding the waves of Casa de Piedra. The writhing waters of the two Class V’s soften into class IV and III rapids before flattening out into a meandering calm. As we drift, take advantage of the fishing poles or hop into a kayak to navigate your own way. Over the course of three miles, relax with happy hour on the river before we reach our Lago Yelcho take-out. Once we return to camp, you once again have your choice of amenities and activities to choose from before gathering together for another delicious dinner prepared by our camp chef. We once again wake early and prepare ourselves for another day on the river. Today you take on the mighty Fu on duckies—otherwise known as inflatable kayaks or IK’s. These individual water crafts give you some flexibility as you paddle your way up the canyon to the Río Azul, a glacier-fed tributary known for its turquoise colored water. Photo-hungry canyon walls flank the chilly glacier waters. We paddle through Class II and III rapids before reaching the Class IV rapid known as “Cheese-Grater.” This rapid carves through jagged volcanic rocks; it’s a breath-taking thrill for those who wish to take it on. If the “Cheese-Grater” looks overwhelming, there’s a portage option as well. We return to the camp in late afternoon, giving you some time to get some more fishing, hiking, mountain biking, or relaxing in before happy hour and dinner. The nights get brisk, so settle around the campfire before bed. Today takes an equestrian bent. After you enjoy a morning yoga session and breakfast, a short drive takes you to the stables where horses are waiting for the day’s adventure. We head out into the stunning valley bordering the Río Azul accompanied by our river guides as well as local, expert equestrians. Our 2-hr ride through the Patagonian terrain takes us to a quiet beach upon the river where we stop and relax with a picnic lunch featuring authentic Patagonian Asado. After lunch, we set off on a brief, 30-minute hike to the Cascada waterfall that falls from a 300ft height into a limpid pool below. Then, explore the beach or perhaps take a short siesta before we ride back to camp. Then, a well-earned massage might be on the menu or some time in the hot tub before happy hour and dinner. We’re back in our rafts today as we head to the Inferno Canyon, whose sheer walls make a jaw-dropping backdrop to the rapids below. After we fit in an early breakfast, we travel a short distance to the Río Espolon. There, we get into our rafts and launch into the Inferno Canyon. As we paddle, we first get to find our groove on the low-volume Río Espolon before it gains momentum and converges with the rushing waters of the Fu in the narrow canyon. The upper-canyon features Class V paddling, so get ready for intense white water rapids. Five different rapids dot the curving river passage, creating a non-stop adrenaline rush. The 4th rapid has become nearly impassable due to environmental factors and now requires a brief walk around it. After we paddle through the last rapid, “Exit,” we come upon a long calm. 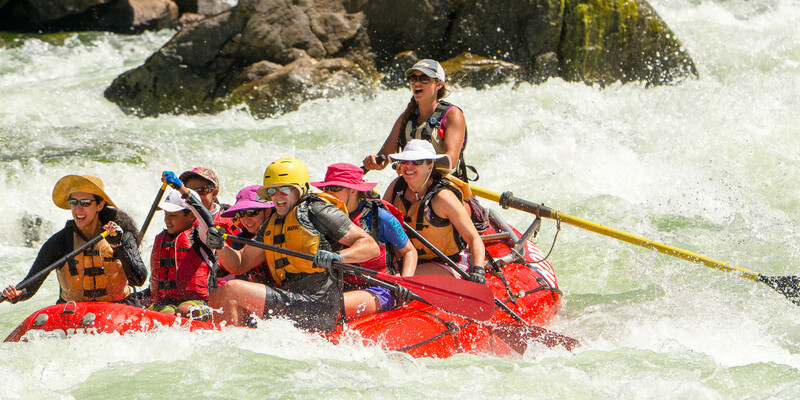 We also provide other activities for those who don’t prefer rafting the aggressive rapids, so there is fun to be had for all levels of rafters. You can join the group after the Inferno Canyon rapids or try out a different activity. Once we rejoin in the calm waters, we cruise for miles down the river and take in the lush scenery surrounding us. We have a stopover at the mandatory portage site of the powerful “Zeta” rapid. Relax with some lunch on the overhanging rocks while the crew “ghost boat” the rafts through the fierce rapid. After lunch, we hop into the rafts once again and paddle our way to the “Throne Room,” a Class V+ rapid meant for kayaks, a ghost boat experience for the rafts. As we take a brief walk, take the opportunity to get a panoramic view of the river-wide hole that interrupts the Fu. Then we’re back on the river and taking on a continuous run of Class IV rapids that bring us all the way to our take-out at the Río Azul footbridge. As afternoon settles, return to camp and relax after a day on the water. Enjoy our amenities and the more-incredible natural surroundings before a dinner under the stars. Today we reach the summit of our rafting experiences. If you want to stretch some muscles before a day of paddling, greet the morning with a yoga class before a hearty breakfast. Then, we make our way back to the Río Azul footbridge where our rafts are waiting for us. Launch into the glacial-blue waters and appreciate the views of the “Las Tres Monjas” mountain, whose snowy ridges cap the skyline. We paddle along a 6km stretch of calmer rapids as a warmup before we reach the longest and most challenging rapid of the trip: “The Terminator.” Plunge into the next three miles of continuous rapids that are sure to get your heart pumping. Up next is the “Himalayas”—a rushing haystack wave train that will make you feel like you’re on a roller coaster. After that rush of adrenaline, cool down with calm waters before we float back to base camp for lunch. Once we finish up lunch, you have your choice of activities for your last afternoon: exploring the area by biking or hiking; lounging around camp; or once again hopping in a raft. If you choose to raft, we paddle the Fu from our camp to below Casa de Piedra on the lower Fu. Cool refreshments are waiting for you at take-out, and then we return to camp after a full day on the Fu. Enjoy your final evening at basecamp with great food, drinks, and company. We dine on a traditional Chilean Asado—roasted lamb with potatoes, ensalada, and fresh bread. Toast to the river under a sky riddled with stars and enjoy the sound of the Fu rushing by. With lots of travelling ahead of us, we wake early for breakfast before heading out. We travel to the coast to Chaitén where we catch the puddle jumper flight to Puerto Montt. From there, catch the connecting flights back home or on to your next destination. As you won’t want to rush to catch your flights, we recommend leaving room between flights and booking connections from 14:00 hours on. If you’re up for another night of adventure, you may stay another night on your own in Puerto Varas. *All activities are river level and weather dependent. While our itineraries are not completely flexible, we pride ourselves in being able to find activities that fit all fitness and adventure levels. Please don't let the potential maximum level of intensity of this trip deter you, the comfort of our camp plus our alternative activities will keep everyone happy. Rate does not include the $200 round-trip airfare between Puerto Montt (PMC) and Chaiten (TEN) per person, based on double occupancy. We will make the reservations for you. Rate does not include $250 roundtrip between Puerto Montt (PMC) and Chaiten (TEN) per person; based on double occupancy. We will make the reservation for you. All prices are based on double occupancy. There is a 10% surcharge for single occupancy. Futaleufu is surrounded by temperate rain forests, it has the potential to rain a lot here. However, luckily for us, most of the rain comes during the winter months which leaves our summers mostly sunny and dry with the occasional rainy day here and there. Futaleufu is as far south of the Equator as Portland, Oregon is north and our summer climates are very similar. January and February are considered the summer months here while December and March are late spring and early Fall with generally great weather but higher chances or rain and colder temperatures. When is the best time to visit Futaleufu? Our season runs mid-December through March and anytime within those months would be great. There is a higher probably of rain in December and March, however during rainy periods with the proper gear and our incredible camp set-up you will hardly notice the wet weather. What is the best way to get to Futaleufu? Our trips begin and end in Puerto Montt, Chile, after guests fly on a domestic flight from Santiago, Chile. Will we have to exchange money at any time while traveling in Chile? No, our trips are nearly all-inclusive and anything extra you wish to purchase (extra massages, photos or videos of the trip, gratuities for the guides, etc) can be done so with the US dollar or by credit card. If you wish to purchase any souvenirs from town then you will need Chilean Pesos and we can help you exchange your dollars for pesos in town. We will accept bookings up to one week before the beginning of the trip. However, you may find it hard to get your desired plane tickets with that short of notice . We recommend booking at least one month prior to the trip but most of our bookings come 3 to 6 months before the season begins. Please refer to our packing list to see what ROW provides and what we recommend bringing. Eight nights accommodation, pick up & drop off at the Puerto Montt airport, all meals and plenty of wine (please note that while we provide plenty to drink, it is not an open bar), all technical equipment for multi-sport activities, all of the amenities at ROW Adventurer's riverside camp which includes hot showers, giant towels and robes, hot tub, Chilean wines and spirits, and a great team to insure your stay is as comfortable and adventurous as you desire. Are photos or videos part of the trip? We provide a photographer or videographer for the trip. The videographer accompanies the group on nearly all of our activities and on river days he goes ahead in his kayak, pulls over on the side of the river by the rapids and shoots video or takes pictures. At the end of trip (and sometimes during the trip) we will get an evening showing of the photos or videos shot during the trip. This is a separate service and while we provide the photographer or videographer, if you wish to have a copy of the photos or videos, they must be purchased separately from the videographer. We have a mixed group with varying ages, activity levels and adventurous spirits. Can you accommodate those that want a more extreme trip and those that are more interested in relaxing with a some activities mixed in? Absolutely! While we do not offer alternative options for all of our activities we often have mellow options for those not interested in the "extremes" of the trip. For example, we offer both a strenuous hike and a mellow walk and for those not interested in taking on the Rio Azul and Rio Espolon in inflatable kayaks we offer raft alternatives. Plus, there is always the great option of taking a half day or full day off and relaxing at our amazing riverside camp to have a mid-morning massage and read by the river. In fact, many of our more adventurous guests often elect to take an activity off to enjoy life at camp. Do you offer family adventures for younger kids? Yes, we do. There are a wide range of family activities in the area from going to local farms, family float trips on the Espolon River and mellower stretches of the Futaleufu, to enjoying the Fu camp area. Can I customize my adventure? If we can make it happen for you, we will! If there are any activities that you either want more of or that are not included in our sample itineraries, please let us know and we will do our very best to accommodate those desires. What sets ROW Adventures apart on the Futaleufu? 1. The simple luxuries of our riverside camp. Our camp property is the most comfortable and detail-oriented of all options available to you. This superior attention to detail manifests itself in our safari-style bungalows, luxury bedding, gourmet chef, masseuse, full bathrooms, hot tub, and most importantly in the amount of care and attention given to every one of its visitors! 2. The Food! Our chef is absolutely amazing. Almost every trip we hear comments like, "that might be one of the best meals I have ever had, not just ever had while traveling, but EVER HAD!". Dinner is 3-5 healthy gourmet courses that range from Rolled Lamb Roast with our Cherries and Berries Curry Sauce to Red Salmon Ceviche with deserts as incredible as Five Spices Flan and Tiramisu. 3. Safety on the River. We have the highest ratio of guides to clients on the river. Every raft obviously has a guide, but each raft also has it's own personal safety kayaker and we have a safety cataraft for every 2 or 3 rafts on the water. We rarely have swimmers but when we do, your time in the water is as short as possible because of our world class safety team. It is not necessary to have a visa to enter Argentina or Chile. When you enter the countries, you will get a tourist stamp in your passport with the number of days you are allowed to stay in the country (up to 90 days). What type of electricity is used in Chile? Chile's electricity standard is 220 volts/50Hz (the standard in the U.S. is 120volts/60Hz). Some (but not all) electronics from the United States are 100-240 volts/50-60Hz) so they are compatible with the outlets in Chile. Please check the electronics you wish to bring down (if they will need to be charged) to be sure they are compatible. Electrical sockets have two openings for tubular pins, not flat prongs, so you'll need a plug adapter. What are the typical meals on the trip? Breakfast is a healthy mix of fresh fruits, locally made cheeses, Patagonian eggs, yogurts, and cereals, with homemade bread and freshly made juices. We are never too busy to stop and have a gourmet lunch, whether it be on the side of the river, under the shadow of a cascading waterfall, or on the mountain side overlooking an incredible valley, lunch is what fuels the afternoons activities and we provide you with the nourishment and taste to keep you going. As great as breakfast and lunches are, dinner is where things really start to get impressive. Dinner can range from Baked Chilean Seabass with garlic, onion, tomato, butter and a splash of cream; served with lemon basmati rice to Grilled Rib Eye steak with onion confit, roasted rosemary potatoes, tomatoes, and a beef reduction sauce. On the Futaleufu we use top of the line 18 foot rafts and put no more than six paddlers per boat. The guides have oars in the back of the raft while the paddlers up front have paddles. This is called a paddle assist or stern mount and gives us the power of the paddlers and the control of oars.